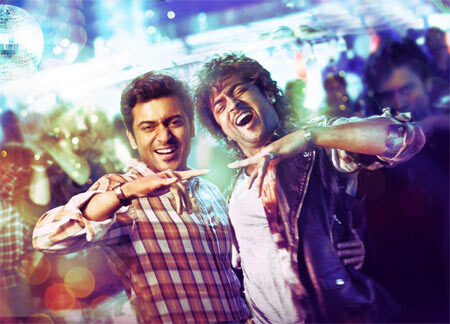 After the hugely successful Ayan and Ko, K V Anand is back with his next film, Maattrraan with Suriya and Suriya. Yes, there are two Suriyas in the film. He is not doing a double role in the conventional sense, but plays conjoined twins, so we will see two Suriyas joined together throughout the film. Now you know why the title of the film is spelt Maattrraan. It was not numerology but the story of the film that made K V Anand opt for the double letters. There were rumours that the film was inspired by a Thai film but Anand denies it. is unique and these two people played by Suriya are also unique. Though joined, they are two different individuals," Anand says. Pictures were distributed of the twins and also of Suriya alone, so were they finally separated by surgery? "No, they are not separated. You can say that those pictures are dream sequences!" Anand said from where he was shooting the last song of the film. "After this song, I will have to concentrate on the post production work which is very important in a film like this. As the audience will see conjoined twins throughout the film, it needs a lot of graphic work." Kajal Agarwal, Marathi actor Sachin Khedekar and some artistes from Russia play other major roles. The film was shot extensively in Chennai, Bangalore, Hyderabad, Ooty and Latvia. The music is by Harris Jayaraj and story and screenplay by K V Anand and writers Subha. What role did IB play in the Netaji mystery?